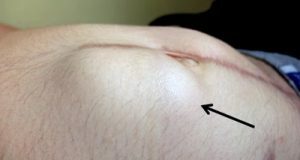 An incisional hernia is a bulge or weakness that has developed within a scar from previous surgery. They can occur when there has been a complication such as a wound infection or after major bowel surgery. Sometimes they can develop years after surgery, after a period of straining or heavy lifting. Patients notice a swelling within the scar (or to the side of a scar). Sometimes a number of bulges may develop around the scar. These lumps often reduce on lying down but in some patients there is a risk of strangulation (where bowel can get caught). Incisional hernias are nearly always repaired due to the risk of strangulation. However, the operation may be long and very complex, especially if there are a number of defects within the abdominal wall. The operation is always performed under general anaesthetic. For some patients a laparoscopic (keyhole) approach might be suitable, but for others, the original scar is opened. The hernia defects are cleared and the holes repaired using a mesh placed underneath the abdominal muscles. Sometimes additional permanent stitches are also used. In some patients a small tube (a drain) is placed into the scar. This remains in place for a few days. Absorbable stitches are used to close the skin. Most patients remain in hospital for a day or two. For some patients the risks of complications of incisional hernia repair surgery are great. In this situation your specialist may discuss other ways to control the swelling by using a corset or hernia belt. You will need to see a member of the orthotic department to be measured for these appliances.